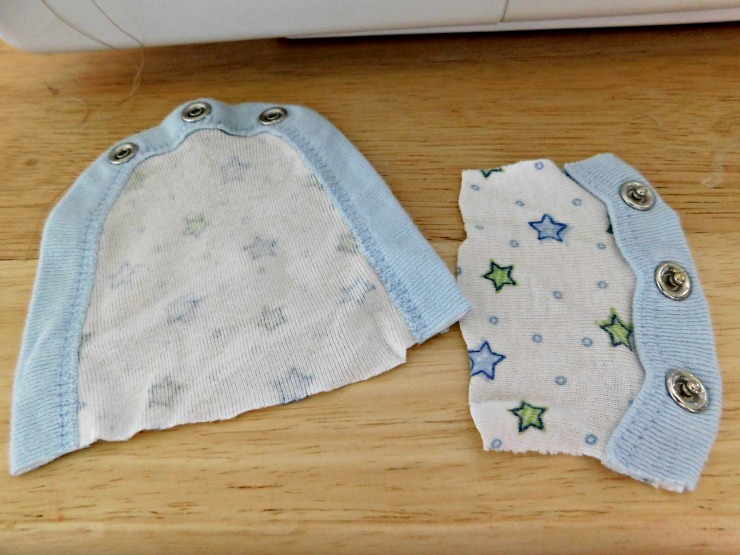 We love (LOVE) cloth diapering. It's been going really well so far- we haven't had any issues at all, I'm not adding to a landfill, and they've more than halfway paid themselves off already. The only trouble we've come across is that sometimes onesies don't cooperate over the extra fluffy bum. 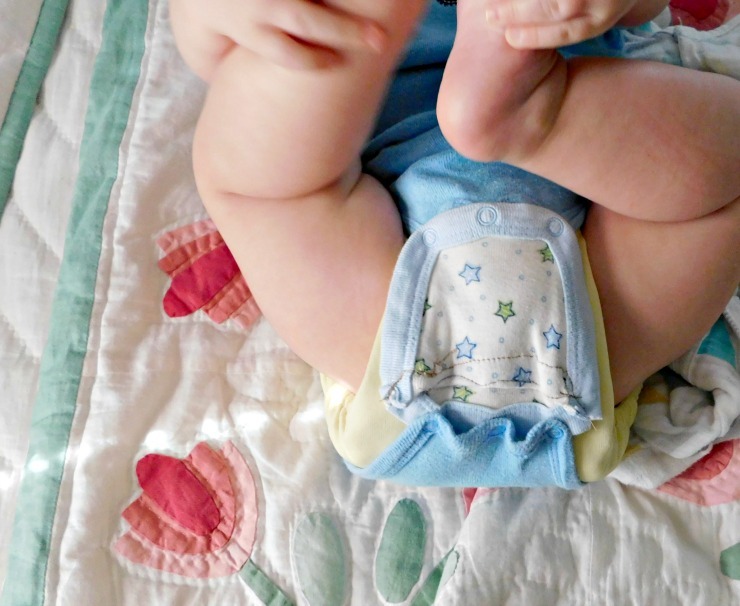 We end up with compression leaks when the snaps are too tight in the crotch area, or we have to size up the onesies so they are long enough to go over the larger cloth diapers. So I took it upon myself to make a couple extenders! The first challenge- onesies don't all have the same size snaps. Reeee-diculous. Different brands have different sizes, and after some testing, I found that most of the onesies we have are one of two sizes. So. I had to make two different sets of extenders. 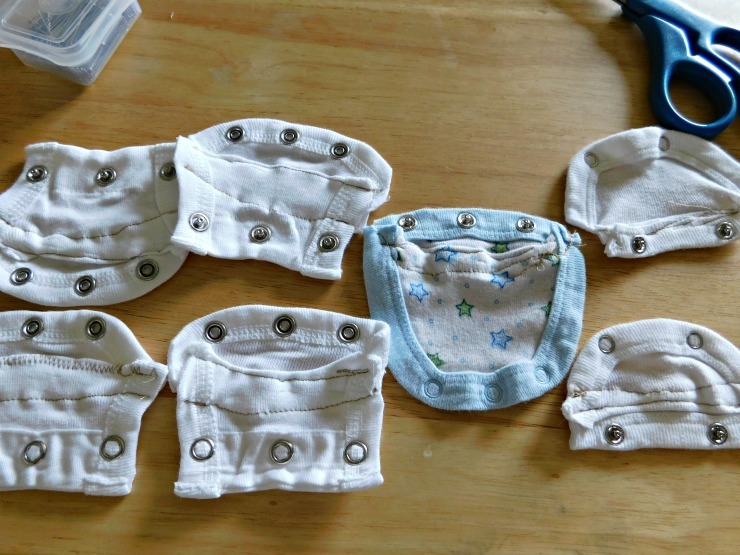 I used some onesies we already had as the raw materials for this project. We had several onesies that just didn't get used much for one reason or another. Most of the ones I used for this project were ones that got stained by Poly-Vi-Sol or spit up. 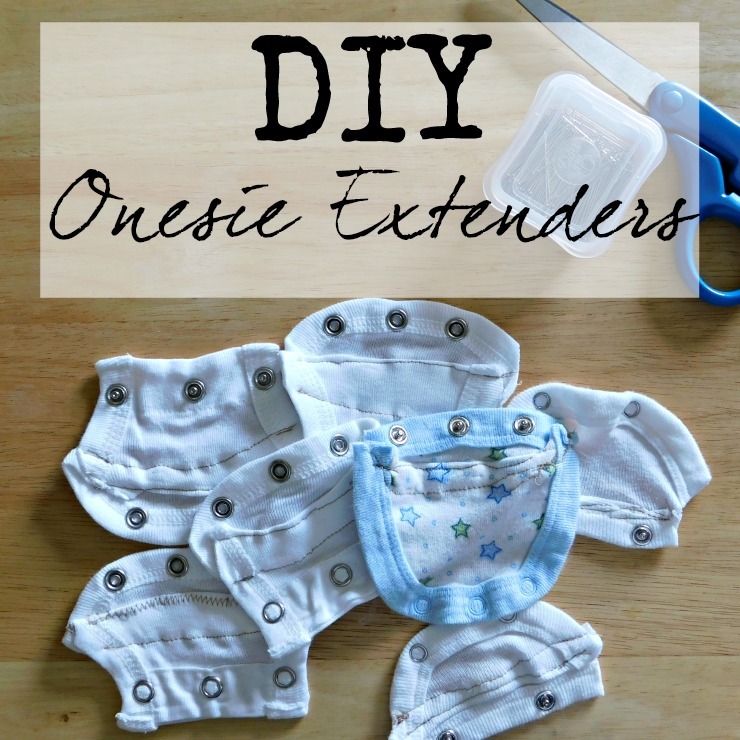 I'm not too picky about stains, really, but I figured that I could use those onesies that were too rough to donate someday for this project so these extenders would be totally free. I committed the cardinal sin of the 21st century with these extenders... I didn't Google before I started my project. So. There may very well be a lot of much easier and better ways to get this done out there, but this was my sloppy method. Grain of salt and all that. 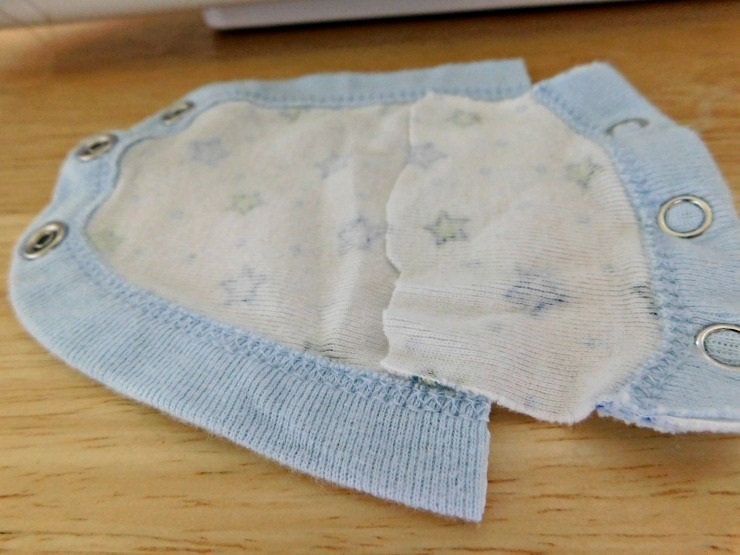 First, I started by cutting the snap part of the onesie off. 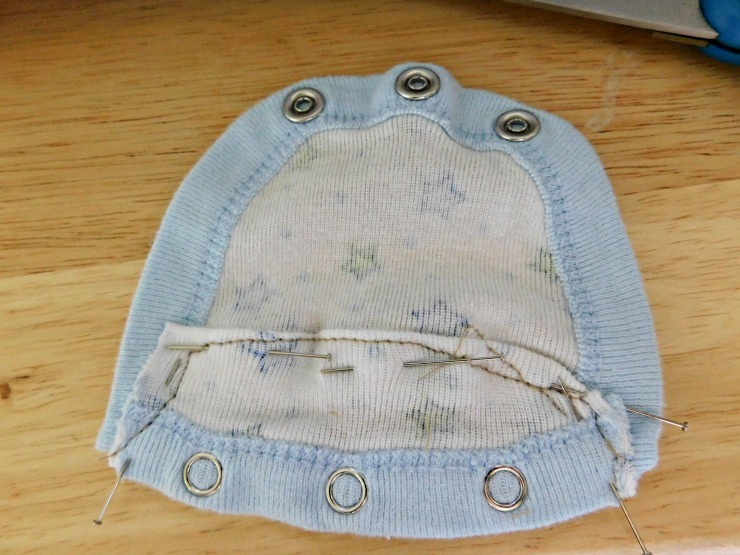 I cut quite a bit of fabric off with those snaps- it's not hard to trim extra off. Then I placed the two pieces together, overlapping them about a quarter of an inch. You want the male and female ends to be facing opposite directions (in this picture, I have the female snaps facing up, the male snaps facing down). I pinched the spot where they overlapped and folded the edge over. 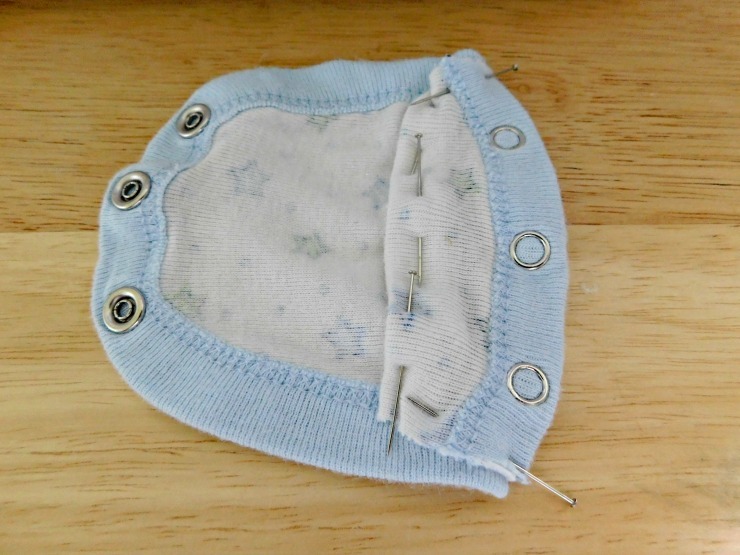 I pinned along the folded seam and along the sides. Using my sewing machine and my terrible seamstress skills, I sewed (sort of) along that folded edge. Sloppily. Then I flipped the extender over, and sewed along that other folded edge. So close up, it looked like this. If I'd had a little more patience and foresight and waited until I had white thread, it probably would have looked a little better... and if I was more careful about my sewing, it probably would look better, too. Who is going to look that closely, anyway? After testing this extender out, I realized that it's actually a little too long- I didn't need quite so much distance between the snaps for the extender to be effective. I made the rest of the extenders a little shorter. 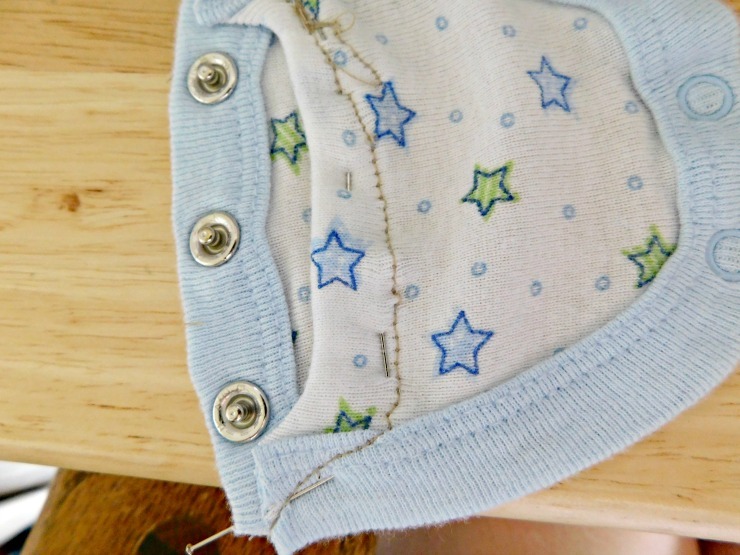 I made four extenders in the larger snap size (because I had four stained onesies with that size snap), and three with the smaller snap size (again, because of what I had available). 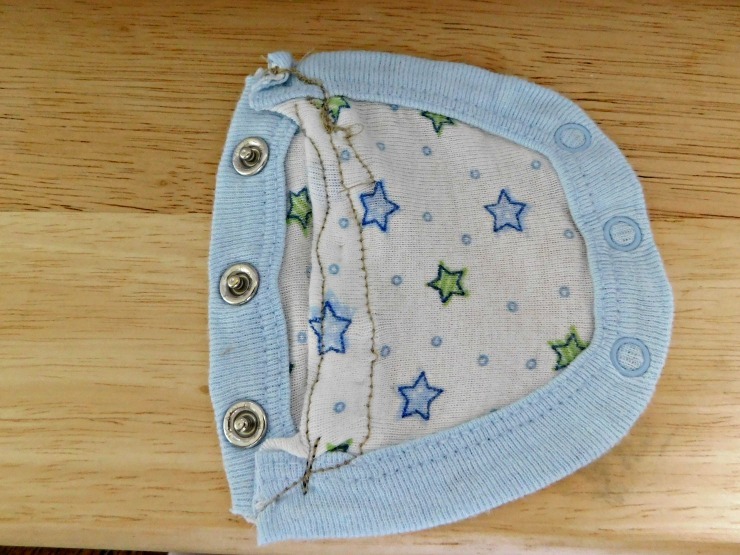 Now I've got some extenders that will keep my onesies the right size for a little longer and will help prevent compression leaks! And all with stuff I already had. My favorite kind of project!